The Drobo 5D Turbo Edition is packaged to meet the data storage needs of today's media creators and demanding professionals, the Drobo 5DT builds on the fully automated functionality of previous drobos by adding blazing-fast performance. Drobo 5DT storage is fast, easy-to-use, expandable, flexible, and protects your data - exactly what's expected from a Drobo. Built on award-winning (No Suggestions) technology with single- or dual-drive redundancy, the Drobo 5DT protects your data without any user interaction, even in the event of multiple drive failures. Thunderbolt 2 technology provides performance that's up to 3x faster than the 5D. Drobo is the only 5 bay direct attached storage array that offers Thunderbolt 2 and USB 3.0. This latest generation of USB also offers high-performance connectivity and is backward compatible with any computer running supported Mac OS x or Windows. To keep capacity of the Drobo at a maximum, the Drobo Accelerator bay accepts an industry-standard SATA SSD, leaving all five 3.5" drives bays available for high-capacity HDDs. 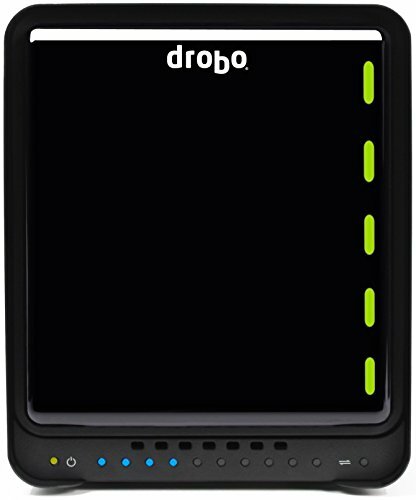 Drobo 5DT includes a battery that protects all data in memory, or cache. During a sudden power loss, the battery keeps the Drobo alive long enough for the data to be written to non-volatile storage, ensuring your important information is safe. This battery recharges itself and is designed to last for the life of the Product. Drobo 5DT is also significantly quieter than previous-generation drobos due to its tuned, large, variable-speed cooling fan. You can even configure Drobo to spin down drives when they're not in use to further Reduce noise and save energy. Drobo LED's can also be dimmed to Reduce light pollution in photo and video editing environments. The Drobo 5DT is an enhanced “Turbo Edition" Drobo that includes 3-year drobocare coverage free of charge with Product Registration. Drobocare extends beyond the standard hardware warranty and, if something goes wrong, we'll send you a Replacement Drobo right away, so you'll have it as quickly as possible - even before you send us back your Drobo. We call it "advanced Replacement"; we also expedite your shipment and pay for shipping both ways. With drobocare, phone support is available 24x7, starting the day you activate drobocare*. please Note that drobocare does not cover failed hard drives.